Business stakeholders say the government could do its bit to push the real estate sector forward by giving it an industry or infrastructure status, which would help lower the cost of funds for developers and reduce prices for consumers. Although demand is not bullish, the sector is rising from its trough, with unsold inventory slowly finding consumers, they say. "Earlier there were around 600,000 units unsold. Now that's down to about 450,000 units in the country," said Narasimha Jayakumar, Chief Business Officer at 99acres.com , a property advisory website. "We are quite optimistic about the whole sector in the next 12 months. I think it's going to increase...it's going to grow," Jayakumar told IANS. Amit Modi, Vice President, Credai Western Uttar Pradesh, said: "In 2017-2018, according to reports from markets such as Mumbai, Delhi and Bengaluru, there is an increment of 30 per cent in sales compared with 2016-2017." Credai is the apex body representing real estate developers. Modi, who is also the Director of the real estate company ABA Corp, said there are instances of rise in prices. "In one of my projects, which is in the premium segment, we started selling at Rs 3,500-Rs 4,000 per square foot four years back, but (now) the price in our project is more than Rs 6,500 per square foot. In some units we have touched the price of Rs 7,000," he added. Online search for properties are also on the rise, said Jayakumar. "There are several examples we are seeing... there is 50 per cent growth in searches. There has been a 45-50 per cent growth in queries for buying," he said. However, although searches and research regarding properties have risen from September onwards, the process of concluding a sale was still slow, said Jayashree Kurup, Head of Content and Advice at magicbricks.com . "In January this year, the market was fairly active from the end-user side before a marginal slowdown in mid-February," Kurup told IANS. "In the last two-three weeks we have seen an uptick again and I think it is a very slow and steady market." Talking about the demand for apartments, the stakeholders said the trend is changing from buying by investors to end-users. "Investors used to earlier buy 50-60 per cent, that number is now down to 8-10 per cent," Jayakumar said. "In many cases the difference between the rent and EMI (equated monthly installment) is only 15-20 per cent, particularly with the credit-linked subsidy scheme, depending on the prices of property and the loan tenure, making it very attractive for the youth to buy," he added. 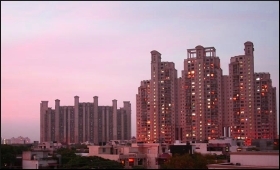 Real estate players felt, apart from the market dynamics, the sector is also seeing structural changes and consolidation among small players, largely after the implementation of the RERA and its mandate to establish state units. Although the introduction of RERA disturbed the status quo in the market, which was largely unorganised and unregulated, its proper and complete implementation would clear up the sector of unscrupulous players and bring about confidence among buyers, they say. Stakeholders, however, expressed concern about not getting industry status for the sector. "Industry status means that you can get access to lower-cost bank financing. You don't have to go to an NBFC (non-banking financial company), other private financing or private equity, which are much more expensive," Jayakumar said. Modi emphasised that to reach the target of housing for all, industry status was required. "(With industry status) the sector will be more organised, one window clearance will be there, and cheap finance will be there, which will definitely stabilise this business and also fulfil the Prime Minister's dream of housing for all by 2022," he said. Although the government provided the industry or infrastructure status to affordable housing projects in Budget 2017-18, it does not seem to be budging on the demand of real estate players for the status to be extended to the whole real estate sector. Going ahead in the year, the market players also believe the rental housing policy will play a significant role in the sector. The policy, which is currently at consultation stage and will be sent for cabinet approval after due diligence, is aimed at alleviating the housing shortage in urban areas by encouraging renting of homes.